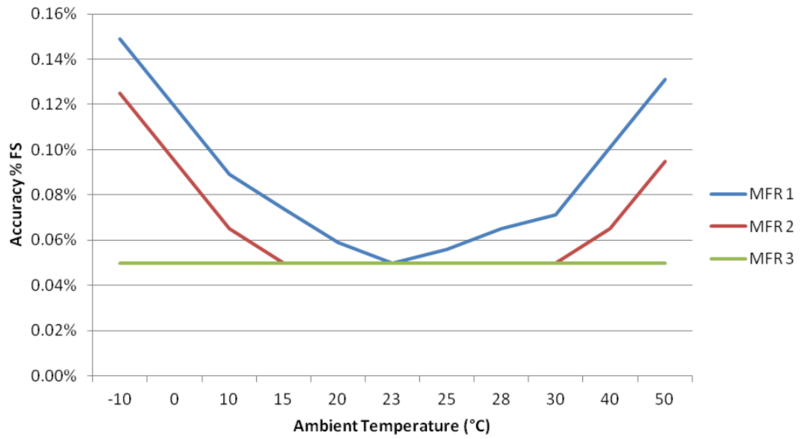 Have you ever wondered how much impact environmental temperature has on your pressure sensors? Nearly every pressure sensor has some sort of environmental temperature specification on its data sheet. This technical note explains the environmental temperature effects on pressure sensors, quantifying the impact, and ways to minimize the impact. Why pressure sensors are impacted by environmental temperature changes ? Much like anything else in the physical measurement world, pressure sensors are subject to changes in environmental conditions. Temperature effects tend to have the largest impact on pressure measurement accuracy. Temperature effects directly influence the pressure sensor and the circuitry used to measure the sensor. Digital pressure sensors use electronic circuits which provide an analog output proportional to the inlet pressure. There are three factors of a sensor’s circuitry that are affected by environmental temperature changes: zero pressure output voltage, pressure sensitivity span and bridge resistance. Temperature-compensated sensors employee some techniques to correct for and minimize the impact of temperature changes on these factors. To understand the environmental temperature effect on your sensor, it is helpful to first understand some common terms you may see on a pressure sensor specification sheet. Operating Temperature Range: This is the temperature range over which the sensor can be used without causing damage. Temperature Compensated Accuracy Range: This refers to the environmental temperature range over which the accuracy of the sensor is applicable. Temperature Coefficient: An additional error that needs to be considered when used outside of the temperature compensated accuracy range. Many sensors are only tested and calibrated at laboratory temperatures. In this case, the temperature coefficient will need to be considered in the measurement accuracy when using the sensor outside of laboratory temperatures. So how much will the ambient temperature impact your measurement accuracy? Well, this will depend on the temperature compensated accuracy range and the temperature coefficient. To demonstrate this, let’s consider three different gauges. As you can see from the specifications below (figure 1), they all have the same accuracy specification of 0.05% FS. However, as you consider the temperature compensated accuracy range and the temperature coefficient you’ll see a fairly large variation between the three gauges. 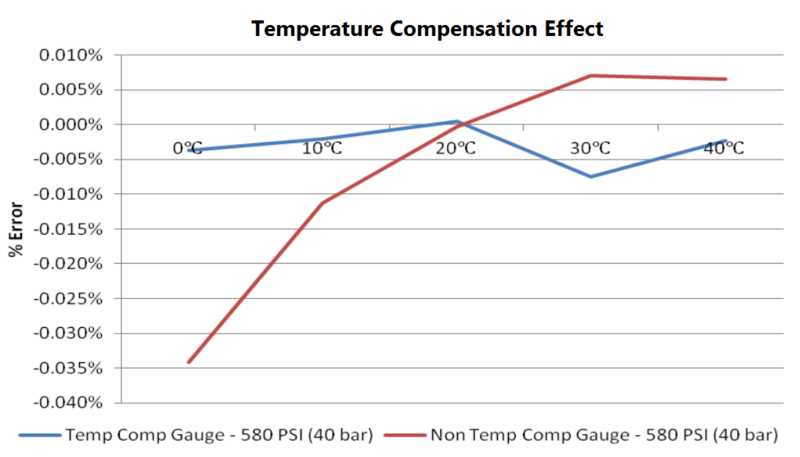 The graph below shows the total specified accuracy when considering the temperature effects on the pressure gauges. As you can see in one case here, the lack of temperature compensation and inclusion of the temperature coefficient specification more than triple the 0.05% FS accuracy specification. The temperature effect on a pressure sensor will be negligible when used at the same laboratory temperature in which it was calibrated. This, however, is often not practical for your measurements. With sensor technology advances, we have found a variety of ways to minimize the temperature effect on pressure sensors and with confidence define a large temperature compensated accuracy range. First, regularly zero your digital pressure gauges. By zeroing the pressure gauge, you are aligning the zero pressure output voltage to the current environmental conditions. You should only zero the pressure gauge when you do not have any inlet pressure on the gauge. Because each sensor is unique and performs differently due to environmental temperature changes, at Additel, we pressure test every sensor in a thermal chamber at different temperatures so we understand its pressure performance relative to environmental changes. Each sensor contains a temperature-compensated circuit which we load coefficients representing the temperature testing of the gauge. This allows for you to confidently use our sensors over the range -10°C to 50°C without having to add a temperature coefficient error to the accuracy. What is the thermal effect on Sensors? What is Hammer Effect in Gauges ?